Brings rigorous methodological analysis to the operations of global supply chains. With focus on ocean transportation, ports, marine terminals and maritime logistics. Emphasis on the business and policy ramifications of academic research. Research that answers to ‘real’ questions posed by business and society. MEL is a peer-reviewed quarterly scientific publication committed to the methodological analysis of global supply chains; that is, ocean transportation, ports, marine terminals and maritime logistics. Papers are expected to be thoroughly researched, scientifically rigorous and at the same time of direct applicability and usefulness to practitioners and policy makers alike. Often, MEL includes a special section under the heading ‘Policy Perspectives’. Papers here, often solicited ones, emphasise strategic policy implications rather than scientific rigour in a strict sense. Papers in Policy Perspectives are subject to lighter peer review and this results in speedier publication. 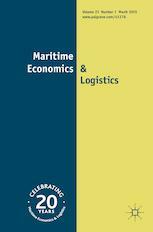 As an official journal of the International Association of Maritime Economists (IAME), MEL is always timely at the forefront of cutting edge academic research on maritime economics and logistics.